By Rosemary Ellen Guiley - Animals are among the dream world’s greatest teachers. They speak volumes to us without ever uttering a word. They teach us by simply being themselves, and their messages are powerful ones. 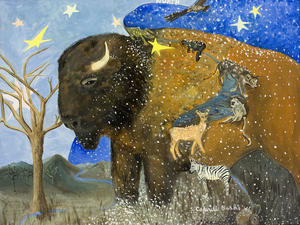 Dream animals tell us about ourselves at a primal, instinctual level of being. They represent physical, sexual, sensual, emotional, and spiritual needs that the conscious mind needs to address. In psychological terms, they represent the unconscious. They also represent the self, and symbolize stages of psychic growth and development. In mythology, animals are invested with an awareness of spiritual reality that is keener than that of humans. Some have magical powers of flight (which represents the ascent to higher consciousness), or invisibility. They have the gift of speech and make themselves understood to those who are awakened enough to hear the message. Such animals are guides into the realm of spirit. Dream animals thus are messengers of great wisdom--emissaries from the Higher Self and from the depths of the unconscious. In mythologies, cosmologies and folk tales, animals are archetypal images that arise from the characteristics observed by humans. For example, a bear represents protection and nurturing, because the mother bear is observed to be one of the fiercest protectors of its young in the animal kingdom. The fox is sly, the dog is protective and guiding, the bird is the soul or spirit, and so on. On a deeper level, the archetypal dream animal may be telling us about traits we need to develop or acquire, or call upon during times of stress. Perhaps their characteristics are something confronting us in the behavior of others. Animals speak to the instinctual layer of consciousness and stimulate the creativity that resides at the “wild” core of being. Heyoka Merrifield, a renowned artist who works with mythological images and themes, dreams a power into his art through animals, especially through his shamanic power animal, the jaguar. Sometimes the dream means that he is to use the animal image in the art; other times the animals teach a lesson. I had to fight a huge lion. There was no way I was going to win this battle. I said, “Okay, if that's the way it is—a fight to the death—then I'll do it. But you're going to have to fight me as a jaguar.” I turned into a jaguar and started walking into battle. Then I realized that I was a black jaguar. I awoke. "I realized from the dream that although my medicine power animal is the jaguar, my feminine aspect, or my anima, is the black jaguar," Heyoka said. "My anima also has its own power animal, which is the shadow side of the jaguar. "The lion represents the primary purpose of life, the most passionate part, which for me is medicine and jewelry. I definitely have found the “king” in my life. My career has been taking off and consuming me a lot, not only the making of the jewelry but also the business end that I have to deal with. My ceremonial life is taking a second seat. My career is a competitive, masculine thing and my ceremonial life is feminine energy. I see that I have to rearrange things so that my career is more in balance with the ceremonial side." Heyoka honored the dream by using the animal dream images in a new piece of jewelry, and by restructuring his time. B. [my former husband at the time] and I live in a house surrounded by woods. For some reason, we give refuge to a fawn and a small goat, who come into the house. (We also have our two dogs in the dream.) Looking out the window, I see a mountain lion, and now I know why the wild animals sought shelter. When the mountain lion is gone, we release them; the fawn bounds across the road in supernaturally high leaps in which it literally floats through the air. Then I see a bear outside. We get the fawn and goat back in, and some strange dogs come along with them. Soon we are giving refuge to many animals, both wild and domestic, all the time, whenever a danger is present outside. Word of this spreads, and people start bringing us their unwanted pets. Soon we have a house full of animals. A man brings a steel bowl containing a litter of newborn sheepdog pups. There is a shallow layer of water in the bowl. I take the bowl and put it in a room while I tend to the other animals. When I go back to get the pups, I find they have all drowned in the water. The shock is enormous and I am devastated. How could I be so negligent? I should have taken them out of the bowl immediately. I tell B. and he is very upset, too. I am awakened and the dream ends. “I was quite emotionally distraught over the image of the drowned puppies, so much so that it was difficult for me to work with this dream,” Amanda said. “When I did and was able to see its true meaning, I was greatly relieved. The animals represent deep, unexpressed creative urges. I especially saw this in the fawn who virtually floats through the air. The animals are magical, like creativity. They come in out of the woods—the unconscious—and seek refuge, or nurturing. Similarly, ideas must be nurtured. These images symbolize the incubation that an artist must allow for new ideas to spring forth. “However, I wasn’t allowing that incubation or expression to happen. I was too preoccupied with events in daily life to give sufficient time to birthing and nurturing new ideas. I was allowing all sorts of things to crowd into my ‘house’ and was putting my art on hold. The mountain lion and the bear represent the distractions that threatened to devour and ravage the creativity. Yet as animals they are creativity, too—it was my own creativity turning in on itself. “I saw how I had been taking my newborn ideas and then neglecting them,” she said. “Neglected, they can only die. In the dream, I have too many things vying for my attention. The message is to focus myself, pay attention to my art, and listen to what my creative side is trying to tell me. Dreams of neglecting animals are common. When they occur, we need to ask ourselves what fundamental, vital area of life is likewise being neglected. One of the most frequent animal dreams is of snakes—a frightening image if we have a fear of them or have religious views linking them to evil. The snake, however, is one of the most powerful symbols of psycho-spiritual transformation. The snake represents renewal of the personality, regeneration and change. It is also a symbol of kundalini, the “serpent power.” In alchemy, the snake is the serpens Mercurii, the quicksilver that represents the constant driving forward of psychic life forces: living, dying and being reborn. The snake is the prima materia, the unformed and dark chaos, from which order and life spring. Alchemical art often shows the snake wearing a gold crown, gem, diadem or light to depict its expanded spiritual consciousness, which, like kundalini, arises from the same energy as sexuality. The snake is an important symbol of healing. Aesculapius, the Greek god of healing, had a snake as his animal totem. In dreams he appeared with a snake or in the form of a snake. Domesticated snakes were kept at the sacred healing temples of the classical world. The healing power of serpents is cited in the Bible as well: Numbers 21:8 describes God instructing Moses to set a fiery serpent upon a pole, so that all who look upon it shall live. A single snake entwined on a stick is the symbol of Aesculapius. Double snakes entwined on a pole comprise the magical wand or caduceus of Hermes/Mercury. Both have been official symbols of the modern medical profession. The caduceus also demonstrates the double path of kundalini as it travels up the chakra system from the root chakra to the crown chakra. Snake dreams are likely to occur when we face periods of intense spiritual change. They may indicate a transformative process already underway, but more often call attention to the need for us to move to a new level of consciousness. We may fear the snake as we fear change itself--so much so that a dream snake pursues us or bites us in order to force our attention. Snakes crawling on the body may herald an awakening of kundalini in the form of creative or visionary experience. Whether they seem to be friend or foe, dream animals are our spiritual allies, guides and teachers. They point straight to the core essence of life.